I am so excited to present a Donosti Dining Update that is very near and dear to my heart: Latin Invasion. Fortunately for my margarita-loving and cheesy spicy self, it has become somewhat of a fashion for Latin-flavored eateries to pop up around the city. In the "old" days, I pretty much had to satisfy my cravings at an undercover Colombian place in Amara or a strange Caribbean spot with nachos in the La Bretxa mall. Things have evolved—from a Peruvian spot that's transitioning from pop-up to reality (quinoa burger pictured, above) to a casual Latin place by starred chef Andoni Luis Aduriz. 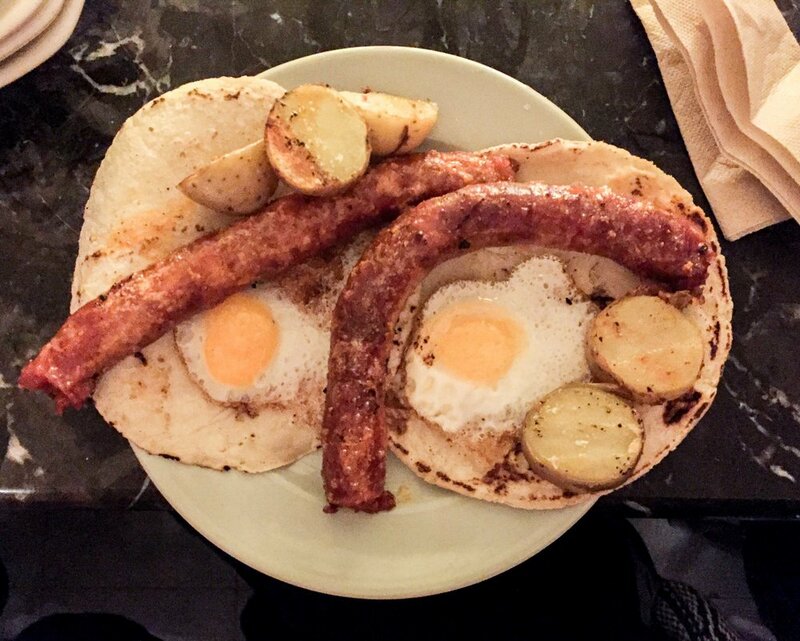 Read on to find out where to taste the latest in Latino food in San Sebastián. This Peruvian spot really hits it out of the park. Housed in The Loaf bakery's flagship shop, they open for lunch and dinner with a menu of tempting appetizers and specialty sandwiches. Maybe it's the reasonable prices; maybe it's the fact that the food is really, truly redolent of authentic Peruvian flavors, but you can find this place packed most nights of the week—and almost always with at least one table of Peruvian expats. Now that is legitimacy. Named for the figurine that Peruvians weigh down with symbols of their hopes and dreams, Ekeko brings traditional flavors up to a modern speed. The croquetas de ají gallina are the must-order house speciality, though in my opinion, the causita frita is just as delicious. The bread for the sandwiches (from purple corn focaccia to whole wheat mollete is made by the bread artisans at The Loaf, especially for Ekeko. The lomo saltado is the classic sandwich stand-out, although the butifarra, a house-roasted ham, deserves just as much of your appetite. And the pisco sours are mixed by Peruvians that used to run a pisco bar in Lima. 'Nuff said. Perhaps the year's most highly anticipated opening, Topa comes from the Mugaritz crew, led by Andoni Luis Aduriz. The restaurant is a study in what happens when Basque ideas and ingredients come in to contact with Latin America. The pound-it-yourself guacamole is a crowd-pleaser. The menu features a section of 'taco talos', which mix nixtamalized corn with millet for the base, in effect creating a Basque-Latin tortilla. They are the safest bet, ranging from al pastor to roast beef. However, the menu is much more than tacos, featuring a section of grilled mains as well as loads of seafood, in the form of tiraditos or tempura-fried squid. The menu and the space are carefully created and curated, the result of years of R+D behind the scenes. When the restaurant opened, the mole was already several hundreds of days old—and there's something inherently lovely about a sauce that demands to be fed on the daily, whether it's served with profiteroles (as the mole was at the opening) or tortillas (the current setup). This buzzy place is just plain fun to visit. The cocktail menu reads like a dream, although the execution is anything but regular. Although I appreciate the bartender's question about whether I like my margarita sweet or acidic, I would argue (along with the IBA) that a margarita is a margarita...if only it would taste like one every time I ordered it! Lately I've switched to some of their safer drinks, like the sangría topa. From the duo behind the former Zurriola hotspot La Consentida and Drinka in Antiguo comes a more purely Mexican-focused spot. La Mera Mera has a fun, grungy Latin look and it is always hopping with locals. Originally conceived as a mezcalería, the focus shifted more towards general Latin cocktails and a broad brush of Mexican and Latin American specialties, from agua chile to chilaquiles to a guacamole studded with toasted pumpkin seeds. The cocktails are always balanced, strong and spot on. The food is a bit pricey for what you get, and at times feels less thought out than the other two spots in the post—a rendition of the favorite Basque food, talo and txistorra, falls flat and dry as a taco option. The agua chile, on the other hand, was really lovely and spicy (a nice surprise in San Sebastián). But any Mexican restaurant is a friend of mine (literally, any, we're talking super low ability to resist when it comes to nachos)...so I wish a long life to all these new Latin spots!